The FIFA World Cup took place in Brazil from the 12th of June to the 13th of July, 2014. The tournament was won by the German national team, which beat the squad from Argentina in extra time with a score of 1-0. Mario Götze, who was sent on in the 87th minute for Miroslav Klose, scored the winning goal in the 113th minute. A total of 32 teams competed in the 20th edition of the biggest international soccer tournament in the world. Brazilian squads have won the most World Cups so far, winning the tournament five times. At all World Cups combined, including the 2014 edition, a total of 2,379 goals have been scored. The average attendance in World Cup history stands at 45 thousand. 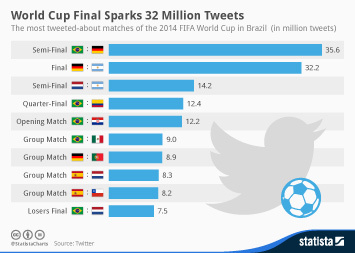 Almost 38 million spectators have watched a World Cup game live at a stadium in total. Total costs for the 2014 edition of the FIFA World Cup will amount to more than 10 billion U.S. dollars according to figures published by the Brazilian government in September 2013. This includes expenditure for stadium construction and renovation, urban mobility projects, upgrades at airports, public security and military defence forces, port infrastructure, telecommunications networks and services, complimentary work for Confederations Cup and tourism infrastructure projects. The 64 games of the World Cup in 2014 were played at 12 different stadiums across Brazil. The Estádio do Maracana in Rio de Janeiro has the greatest capacity with seats for more than 76 thousand spectators. The national team from Brazil is the only squad that has participated in all of the FIFA World Cup tournaments so far. Germany and Italy have participated for the eighteenth time in a World Cup in 2014. Spain, which was one of the favored teams to win the World Cup at the beginning of the tournament, did not advance past the group stage despite sending the most valuable roster to Brazil. All 23 Spanish players combined have a total market/transfer value of more than 600 million euros. Lionel Messi of Argentina, who won the Golden ball award for best player of the tournament, was the player with the highest individual market value at 120 million euros. More interesting topics from the industry "Sporting Events & Marketing"